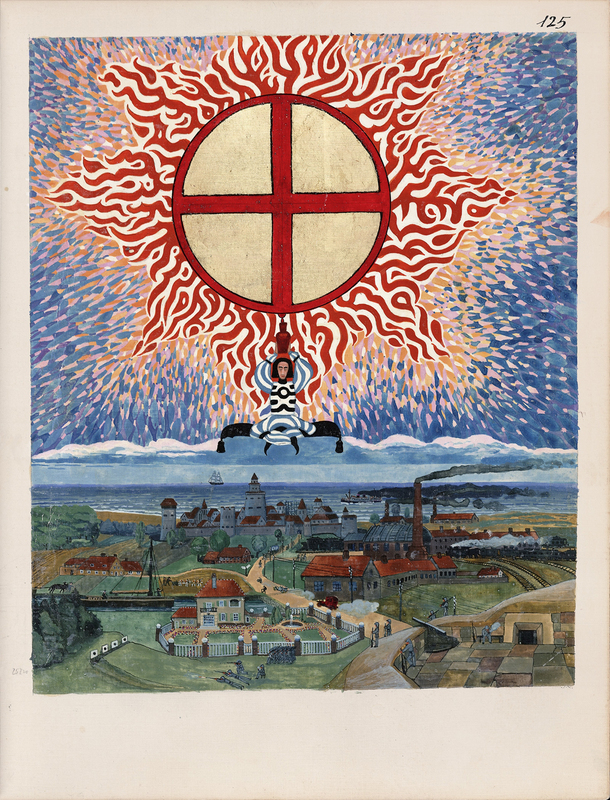 The Hammer Museum presents The Red Book of C. G. Jung: Creation of a New Cosmology, an exhibition of preeminent psychologist Carl Gustav Jung’s (1875-1961) famous Red Book, thought to be the most influential unpublished work in the history of psychology by many contemporary scholars. Jung also considered the Red Book to be his most important work, or as he described it, the "prima materia for a lifetime’s work." Until now, however, the book has spent most of its existence in a Swiss safe deposit box, and very few people have actually seen it. This exhibition, organized by the Rubin Museum in New York, includes works of art and archival materials on loan from the Foundation of the Works of C. G. Jung, the C.G. Jung Institute in Zurich, the C.G. Jung Foundation for Analytical Psychology, the Jung family private archive, and other private collections. The show is the first public presentation of the remarkable book and it coincides with the publication of a facsimile edition of the Red Book by W.W. Norton & Company. The Hammer is the only West Coast venue for the exhibition and the presentation will also include an important series of public programs to further explore the work of C.G. Jung and his legacy. Carl Jung began work on the Red Book in 1914 at the age of thirty-eight. He had established a successful private psychological practice in Zurich, but subsequently fell into a period of personal and spiritual turmoil. It was during this period that Jung formulated what would become his most important and famous theories about archetypes, the collective unconscious, and the process of individuation. The Red Book is a collection of Jung’s personal writings and drawings, chronicling the often horrific and troubling explorations of his own unconscious. For the better part of sixteen years Jung consistently documented his dreams and recorded his fantasies in a beautiful volume that resembles a medieval manuscript. It is a strange hybrid of thought and image, taking the form of an 11-1/2 x 14-1/4 inch red leather-bound book. On more than two-thirds of the pages, Jung paired his abstract and brightly hued graphic forms with thoughts written in a beautiful calligraphic style. Out of this work and these experiences Jung would transform psychotherapy from a practice concerned with the treatment of the sick into a means for the higher development of the personality. 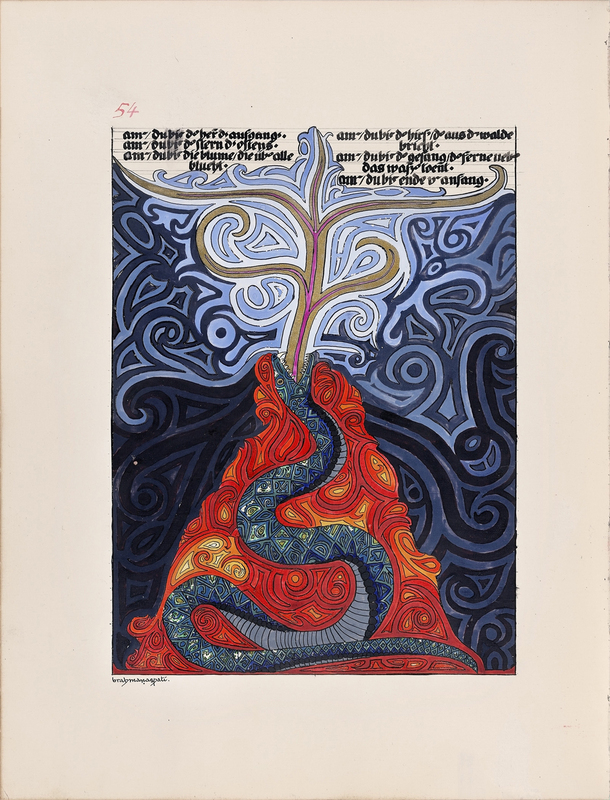 Alongside the ninety-five-year old volume, which Jung worked on from 1914-1930, the Hammer Museum will present a number of oil, chalk, and tempera paintings and preparatory sketches related to the Red Book, and other original manuscripts, including the Black Books, which contain ideas and fantasies leading up to the Red Book. Visitors to the exhibition will be invited to see the ways in which Jung sought to translate the symbols he encountered in dreams and fantasies into contemporary graphic form, often using the circular diagrams of the mandala, which resemble structures represented in Tibetan Buddhist art. On display will be Jung’s first known mandala-like work: Systema mundi totius (1916), a cosmic representation of his reflections on spirituality and the soul, drawn from a series of recorded personal fantasies. 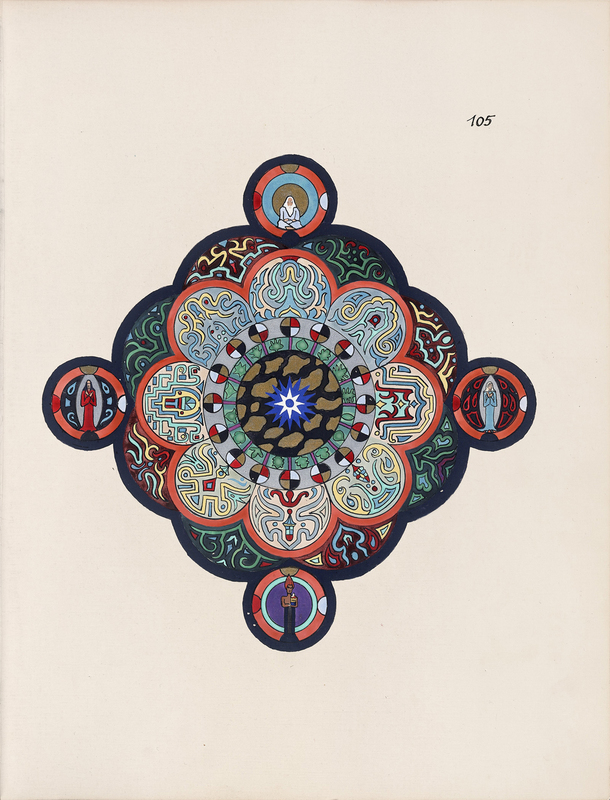 Jung considered this work—along with about twenty-five mandala sketches that he created while serving as a Medical Corps Doctor and Commander of a British internment camp in Switzerland during the last two years of World War I—to be important documentations of his psychological and spiritual development. This exhibition was organized by the Rubin Museum of Art, New York, in collaboration with the Foundation of the Works of C.G. Jung, Zurich, and was curated by Dr. Martin Brauen, chief curator of the Rubin Museum of Art, and Professor Sonu Shamdasani, acting director at the Wellcome Trust Centre for the History of Medicine at University College, London. The Hammer presentation is made possible in partnership with the Philemon Foundation and the Mindful Awareness Research Center, UCLA Semel Institute for Neuroscience & Human Behavior. Generous support is provided by Pacifica Graduate Institute, OPUS Archives and Research Center; The F. F. Foundation; Susan Smalley and Kevin Wall; and Stacy and Ron Pulice; and Lori DeWolfe. 89.3 KPCC FM is the official media sponsor of the exhibition.